Mullangi Sambar / Radish Sambar recipe is a classic, and of course an authentic side dish recipe from South India. This sambar is made with the toor dal(lentil), radish, tomatoes, onion, tamarind, and some spices. This lentil dal is healthy, tasty and pack with loads of flavors. My Love affair with sambar is never ending. I did not know the time when it is started. And I did not know the time when it is going to end. I would say it is a lifelong connection with the Sambar forever. I make this sambar regularly almost every other week in my cozy kitchen. Whenever I buy a radish from the market, I’m for sure I’m going to make Mullangi sambar. We love it to have, preferably in the lunch time. And we also like to have with the breakfast dishes. And surprisingly it matches great when served with chapati or roti as well. So I make Mullnagi sambar in large. And reserve some to serve with breakfast or dinner. We eat this as a side dish for almost any main course. This recipe is very versatile that it can match with any main course. The taste and the flavors and the Mullangi sambar is excellent. Once you make it, you will fell in love this its taste. And you will be tempted to make it again and again. The taste of juicy, spicy radish in the sambar makes it really worth to make an attempt at home. The final dish is really delicious and worth the time you spent in the kitchen to make the dish. The important ingredients for sambar are toor dal and radish. Toor dal is healthy and a good source of protein. And the next comes radish. To describe the benefits of radish, it needs a separate post. Radish is high on antioxidants, potassium, and zinc. For some of you who are wondering what Mullangi Sambar is? Mullangi is nothing but radish and Sambar is a dish cooked with lentils and loads of spices. Furthermore, Sambar is a Tamil name for the spicy lentil dal recipe. This is an Indian Cuisine dish especially belongs to Tamil population of Southern India. 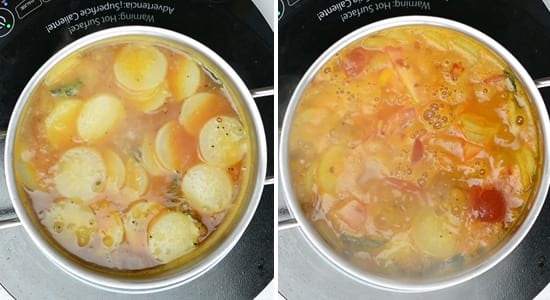 Mullangi Sambar is an authentic and traditional recipe. Which we include in our menu regularly. This is a simple, everyday dish which is healthy and delectable. Whenever I buy radish from the store, first thing I would make would be this dish. If you ask me what is drumsticks sambar and this Mullangi sambar? I would say the basic recipe is common between the two. But just the vegetable is changed. However, the flavor and the taste you get from these two different vegetables are tremendous. On the other hand, they follow the same recipe, have the same cooking method and have the same cooking time. But the final dish would be absolutely differ from one another. Due to the globalization and modernization, new dishes and recipes invade the modern Indian kitchen. But this Mullangi Sallabar is still popular and does not lose its vital role in everyday menu of most of the Tamil people’s home. This Mullangi Sambar is meant to be served as a side dish with steamed rice. But very versatile, as it is best to serve as a side dish for the Indian breakfast items. And also a side dish for the Indian dinner dishes. The spices would include but not limited to a mustard, fenugreek seeds and curry leaves. 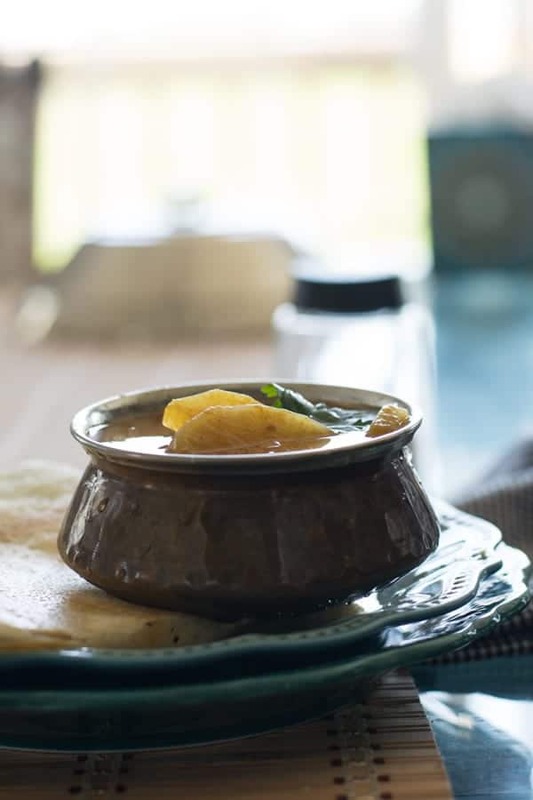 This Mullangi Sambar is perfect balance of deliciousness and healthiness. It is healthy as it is made with protein rich lentil, vitamin rich radish and with just one teaspoon of cooking oil. This is a wholesome healthy dish. I will also say this dish is really worth to spend the time in the kitchen for making. While this Mullangi sambar cooked in the entire Tamil Nadu’s kitchen. The recipe followed by each family would be different. And the taste of this recipe would also differ in every homes. 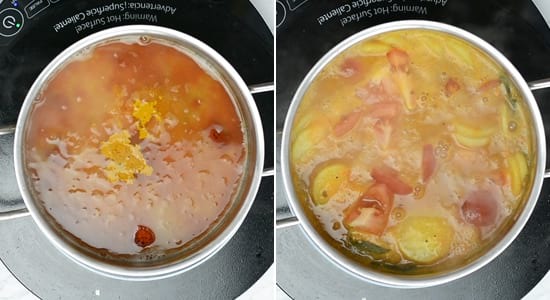 Some prefers thicker version of sambar, while others loves thinner version. And every family has some exclusive spice powder as well. This Radish Sambar recipe is easy and the process is real simple. Still you will get the same authentic and traditional taste. Not to mention, this is most suitable for the people who have a limited time access to that kitchen. Can I use any variety of radish? Radish can be of any veriety, that can range from red or Indian radish. 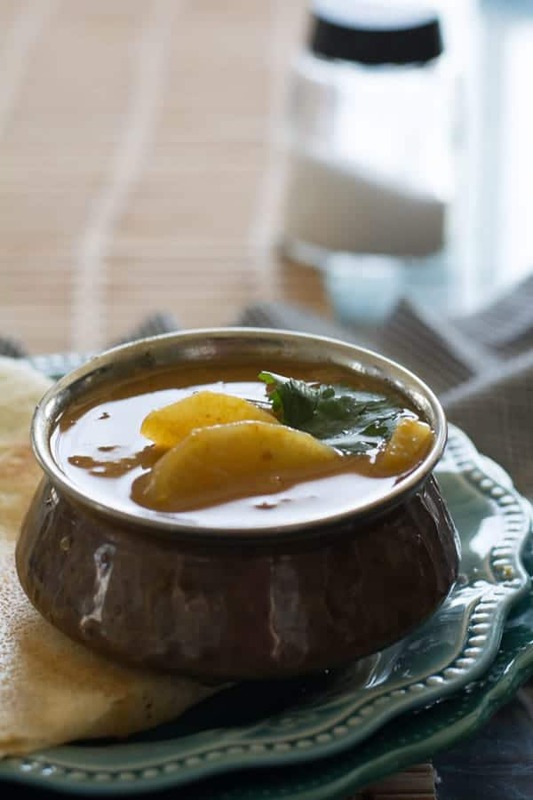 Can sambar be made without tamarind? Tamarind is very important and authentic ingredient added to sambar. If tamarind is not available while making, then it can be substituted with tomatoes. But the taste and the color of the Mullangi Sambar would change slightly. Can sambar be made with chana dal? There is no strict rule to make Sambar. Similarly there is also no strict list of ingredient for cooking. You may also use chana dal. But the texture and the taste would completely differ from the one made with toor dal. Toor dal sambar is thick and creamy, where as chana dal sambar differs from the texture and taste. Personally I prefer to make Sambar with toor dal or masoor dal. Can sambar be made with masoor dal? Massor dal is the perfect alternative to toor dal. The taste and the texture of the dish would not change much when substituting masoor dal with toor dal. Can you freeze sambar? Yes the Sambar can be frozen. It also retains the taste and texture after reheating also. For reheating, microwave it for 3-4 mins depends on the quantity of left over sambar. Soak lemon sized tamarind in 1/2 cup of water for half an hour. Then extract, strain and keep aside. Pressure cook 1/3 cup of toor dal in 2/3 cup of water. Ideally in medium flame for around 12 minutes or three whistles. Rest it for 10 minutes and keep aside. We need these later in the cooking. Peel the skin of the radish and slice evenly. 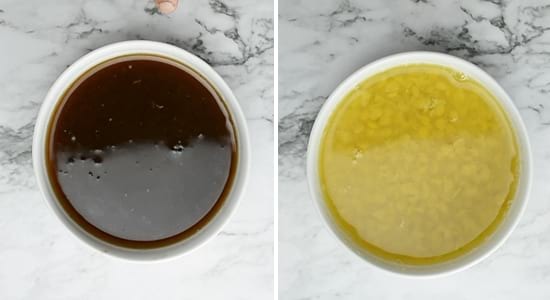 In a pan, add a tablespoon of cooking oil. Add mustard seeds, urad dal, fenugreek seeds. Fry them until mustard crackles. Now add curry leaves, asafoetida powder and finely chopped onion. 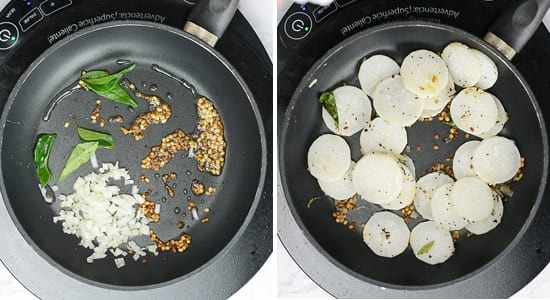 Saute until onion turn pink and translucent. Then add radish, saute radish for 2 minutes. In a pot, add 1 cup of water, cooked dal, chili powder, turmeric powder, salt and roughly chopped tomatoes. Allow it to boil for about 12-15 minutes or until radish becomes well done. Now add tamarind extract, again bring mullangi sambar to boil for 12 minutes or until tamarind leaves out raw flavor. Remove it from the stove. Transfer it to the serving bowl. Store the left over Mullangi Sambar in an air tight container. If refrigerated it is good to use up to 3-4 days. The left over can be served for Idli, dosa, Roti or chapati. Mullnagi Sambar / Radish sambar is a classic, traditional and authentic recipe from South India. Made in Tamil style cooking This sambar is made with the toor dal(lentil), radish, tomatoes, onion, tamarind, and some spices. Pressure cook toor dal in 2/3 cup of water. Ideally in medium flame for around 12 minutes or for three whistles. Rest it for 10 minutes and keep aside. Peel and slice the radish evenly. In a pot, add 3 cups of water, cooked dal, chili powder, turmeric powder, salt and roughly chopped tomatoes. Allow it to boil for about 12-15 minutes or until radish becomes well done. Refrigerate the leftover Mullangi Sambar. This stays good for 3-4 days. When you are saying radish, are you referring to the Indian mūlī (I think) radish which would be like a Daikon radish I believe. Our red radish is small and usually eaten on a salad. I love this dish and would be taking mine with a stack of chapati. Glad you liked this recipe. 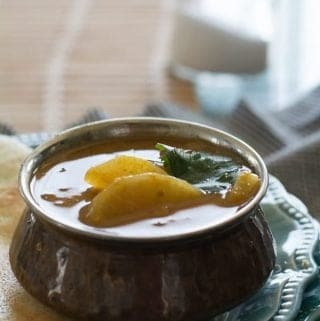 And this sambar can be made with any variety of radish. And this dish does taste great with red radish as well. And definitely chapati would also be a best to pair with.